Now that you've decided to embrace a CRM system, make sure you take these three critical preparation steps. So now that you are ready to make the move out of No CRM Land and embark on the Journey to CRM Success, it is time to pack for the trip. The next phase of the journey is one of preparation, and it includes planning, data review and setup. This is a continuation of the pre-implementation phase of the journey and is the critical foundation for long-term success much like route planning and packing are important for a successful vacation. The best plan will only result in success if the team fully supports it. 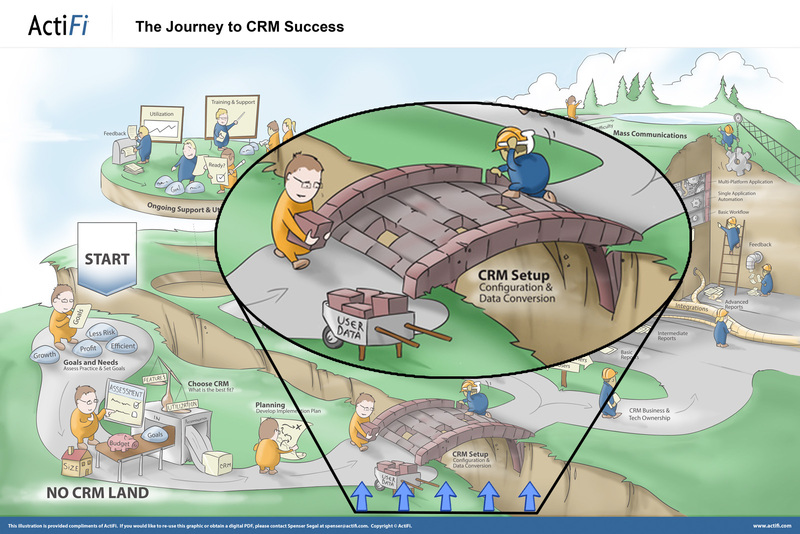 Laying out each step from “No CRM Land” to “CRM Land” with clear ownership for completion is a necessity. An internal project manager who can help keep everyone on task is critical, as is management’s support of their power to influence others’ time. Even when working with an external partner who provides a turn-key implementation, it is necessary to have an internal single point of contact who owns the project and knows the status and potential roadblocks. Done right, the plan created will provide a framework for delivering information to the rest of the team. Sharing with users what they can expect and what will be needed of them will help smooth the overall process. Detailed planning and diligent plan management is the only way to keep the project on track and users apprised of what is coming and when. Now is also the time to review the data that will go into your new CRM. The cleaner and more complete the data is when it goes into the system, the better your results will be. In many cases it takes team members working in concert to get data filled out and scrubbed. Remember the old saying, “GIGO: Garbage in, garbage out?” It is important that data is accurate prior to moving it into the new system. Working in the existing system is the most common place to make updates in preparation for the new system. It usually works fairly well because users are comfortable working in it and therefore quicker and more willing to do the work needed. In some cases exporting the data to a spreadsheet makes for easier evaluation and management of the data as it is cleaned. Many vendors have a process where they can map your old data fields to the new system. It is important to take a step back and make sure that the data model that you have will work well going forward. Usually, advisors find that they can get valuable input from the vendor to improve their data model and get more value from their new CRM system. With a plan in place and data prepped and ready to move to the new CRM. Setting up the new system, configuring it for your organization, and converting the data are the next steps. The new system may provide exactly the functionality needed right out of the box or it may require customization to better fit the organization or support your desired functionality. Mapping data from the existing system to the new system will provide necessary guidance for the data move and help users understand what is changing as the new CRM comes online. Depending on the complexity of the implementation, and the skill set and availability of your staff, this can be completed by your in-house team or, as is often the case, you can work with a third party implementation partner. With these steps complete you will have a solid framework for a successful journey. My next post will discuss the essentials of creating a successful user journey.